In our last SocialScene on influencers, in September 2016, we put a face to these opinion leaders: What are they like? What is it that makes them influential? In this second edition, in addition to updating the world ranking, we have also sought to analyse their audiences. 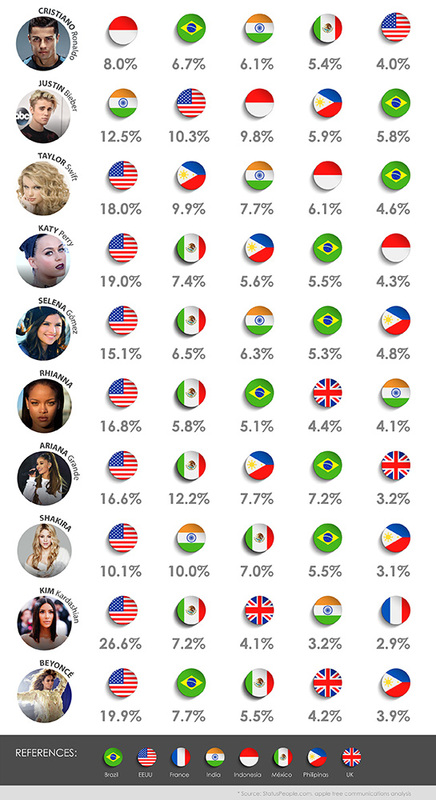 What are the people who follow these social network celebrities really like? METHODOLOGY: For the purpose of this report, only the official channels belonging to individuals on the three main social networks in the western world (Facebook, Twitter and Instagram) were analysed. 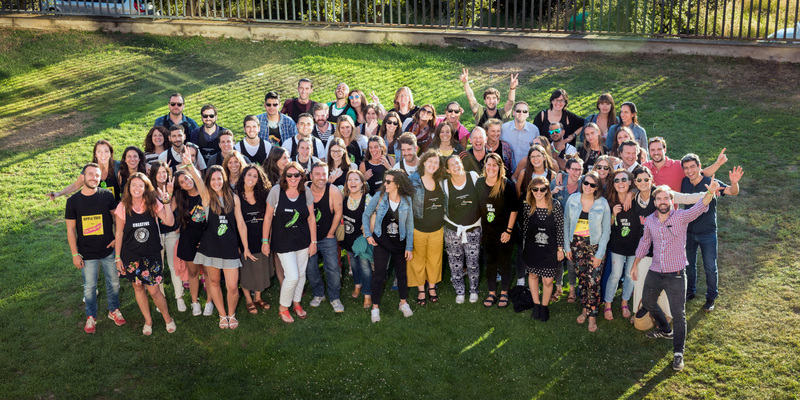 Comparing this year with the 2016 listing, we see a lot of the same faces, but in different positions. Top of the list is now footballer Cristiano Ronaldo, while Taylor Swift has dropped to third place, overtaken by Justin Bieber. Throughout this top 25 ranking we see a small majority of women (64%), mainly from the United States (76%), most of whom are music industry professionals. The major exception is precisely the leader of the group, Cristiano Ronaldo, who differs from the general profile. Facebook continues to be the platform that concentrates the greatest number of fans, despite not being the newest platform. Its long history means its audience has grown to be the largest, although little by little the number of users and frequency of use of other networks, such as Instagram, is gaining ground. WHO ARE THE LEADERS IN TERMS OF ENGAGEMENT? Our conclusions show that the oungest of the Kardashians is the leader in engagement with 2%, despite the fact that her sole occupation is ‘celebrity’, she is positioned above singers, athletes and actors. A figure that stands out is the low level of interaction that Ellen DeGeneres generates, when compared to the rest, since she is considered one of the most opinion leader, though apparently this isn’t reflected on social networks. In terms of the total number of interactions over all the social networks, results show that TW accumulates the lowest percentage of interaction, compared to IG that is the platform where users most interact with influencers. WHAT DO THE FOLLOWERS OF THESE CELEBRITIES HAVE IN COMMON? On a general level, we can see that the majority are women: 62% on Twitter and a 61% on Instagram. Plus, a substantial majority of the audience is, just like the celebrities, American. Cristiano Ronaldo is again the great exception, since his followers are mainly male (59%). As far as the age of the followers goes, the majority of Twitter users that follow celebrities are between 18 and 24 years old, whereas the largest age group on Instagram is slightly older: between 25 and 34 years old. The number of followers these influencers have is in the millions, but not all of these followers are active on social media. Some followers are not even real accounts, but rather profiles set up artificially. If we analyse in depth the Twitter activity of five of the top influencers, we can see that, for example, 6% of Taylor Swift’s followers are fake accounts, more than 5 million! On the other hand, whilst Katy Perry and Justin Bieber, have only 3% of followers who are fake, they both have very inactive communities, with only 9% and 17% active followers respectively. 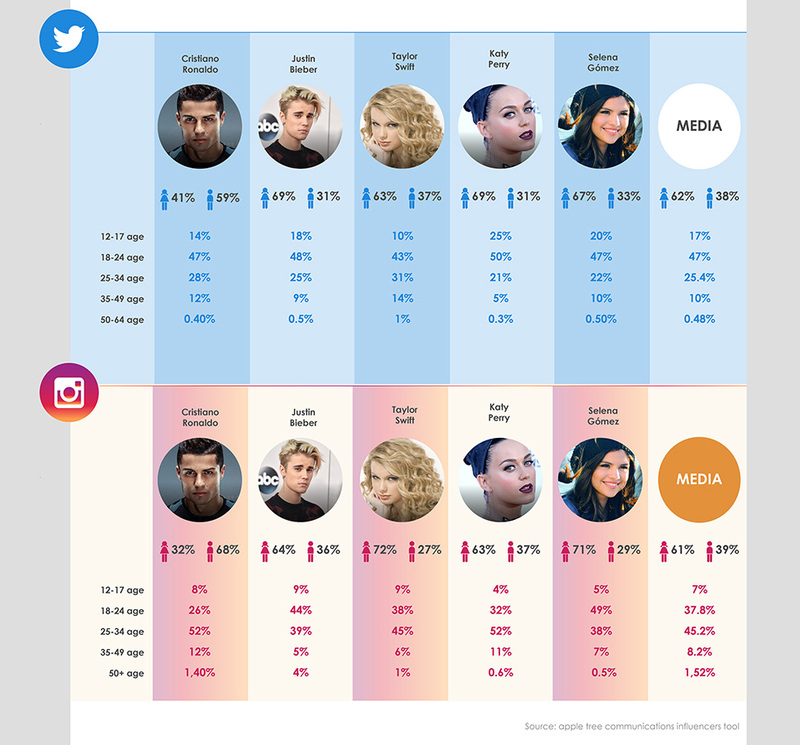 If we rate these influencers according to their active community, rather than according to the absolute number of followers, Katy Perry would be in third place in this top five ranking, and the queen of the ranking would be Taylor Swift with over 28 million active followers on Twitter, well above the runner-up. In addition to knowing how active they are on each social network, we wanted to find out where the followers of the Top influencers come from, taking the data from Facebook to discover, for example, that the majority of Cristiano Ronaldo’s followers are neither from his country of origin (only 1.3 % of his followers are Portuguese), nor from the country where he works (a further 1.3 % of his followers being Spanish). His largest audience is from Indonesia (8%), a fact that may be related to the 5% fake followers or the 90% inactive accounts that he has on another of his social channels. The Americans are the most influential, but what about the influencers in Europe? The ranking of the most followed Europeans in the world changes quite a bit compared to the world rankings. 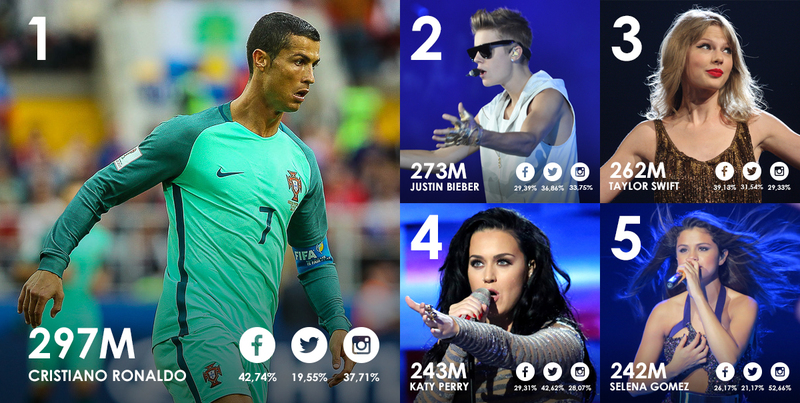 Cristiano Ronaldo alongside singer Adele, are the only two matches with the global Top 25. While singers (especially women) stand out in the global ranking, in the European listing they share protagonism with footballers (10 and 10 in the Top 25). In terms of nationalities, the British presence stands out (60% of the Top 25) followed by Spain, which contributes 20% of the celebrities. However, if we look exclusively at their European followers only Ed Sheeran remains in a Top 10 that now becomes dominated by professional footballers. 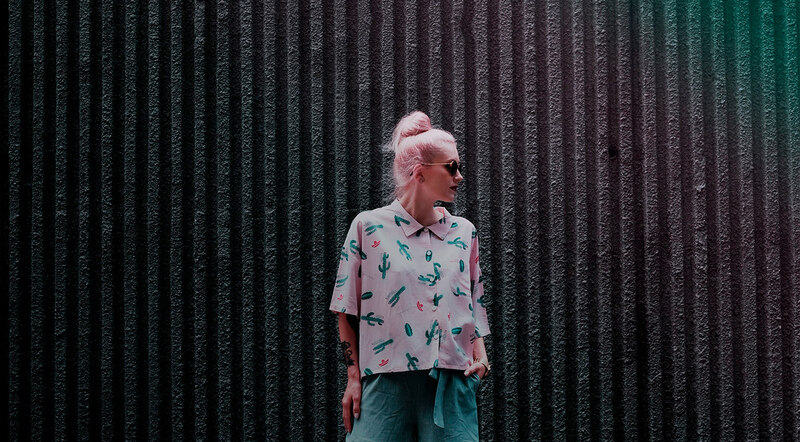 Being an influencer does not depend on age, and there are younger and younger people out there who are attracting millions upon millions of followers to their profiles. Largely because there is no one more influential for young people than other young people. 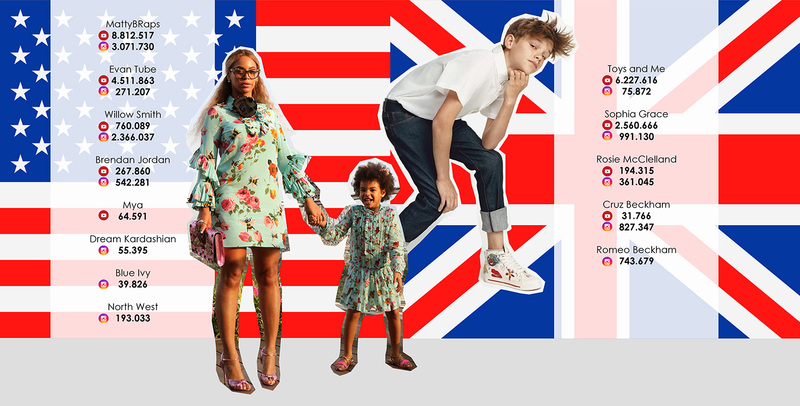 In the United States, most under-age influencers are kids with famous parents: if Beyoncé is your mum or you happened to be born a Kardashian, well, you are going to be famous one way or another. Their social network content tends to revolve around their own lifestyle, with which they set trends. Their image is the product they peddle. In contrast, in the UK the most followed youngsters arise from the platforms themselves: YouTube channels about toys and toy playing (reviews and samples of how someone plays with those objects) or young music stars such as Sophia Grace and Rosie McClelland, two girls that went viral on YouTube and ended up appearing on the Ellen DeGeneres show singing with Nicki Minaj. In a very short time they were making their own songs and video clips with thousands of plays. The Justin Bieber phenomenon is also a case in point.